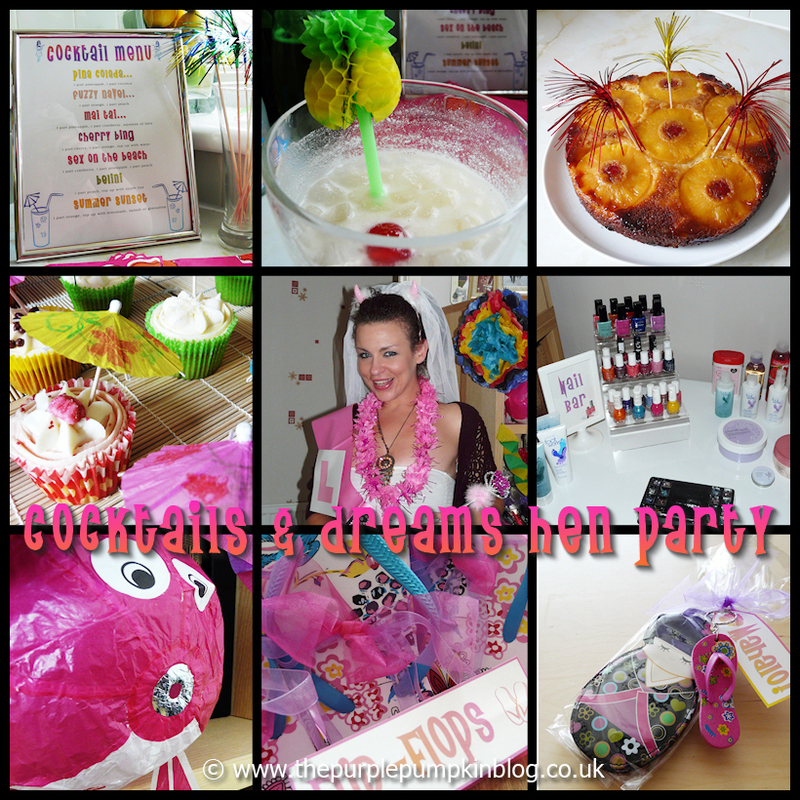 This past week or so I’ve been sharing all the details from my sister’s Cocktails & Dreams Hen Party. I had great fun thinking up all the things we could do, and I know that everyone had a great time! We did so much in a 7/8 hour time span, and my sister told me that a girls night in was a great way to spend her hen night. 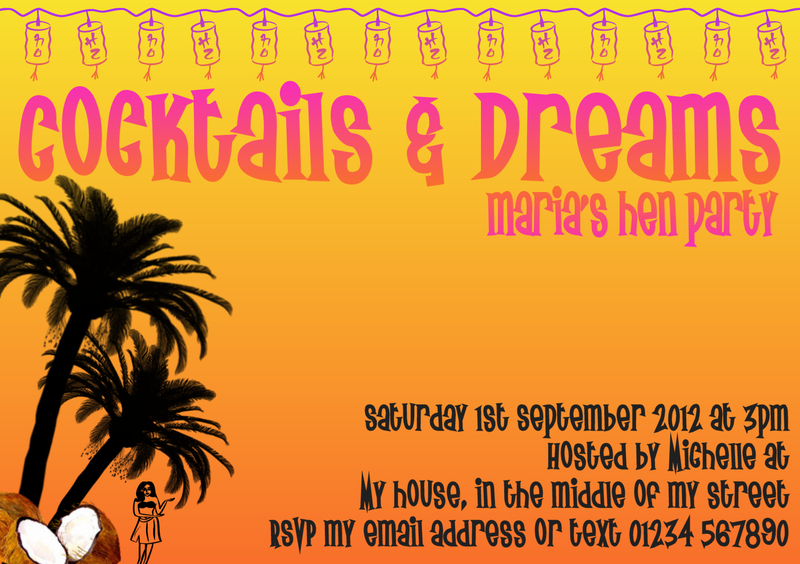 I don’t always create party invitations, because a lot of the time it’s just the family that come along to the shindigs I throw at home, but since this was one for my sister’s close friends, a digital invitation went out to them all that I designed. The party started mid-afternoon ish, and went on until very late evening. My best friend and sister helped me to set everything up before the other girlies showed up, and I decorated the room with some colourful streamers, paper blow up fish, and rather rude hula dolls! We took a few photos of each other whilst everyone took a look around to see everything I’d planned for the day/night. I handed everyone a lei to put round their necks, and the party began! As there were a couple of pregnant hens at the party, my sister and I decided to go for a dry party, so I set up a Fruity Cocktail Bar, with menu, lots of fruit juices and accessories to knock up some delicious non-alcoholic cocktails. It went down really well, and alcohol was not missed in the slightest! Us girls know how to have a great time without being hammered! We played some games that were safe for any sort of company! And we played some that were for adults only! We also baked some rather naughty cookies! When it came to the food, I went for a Hawaiian Tropical theme. Unfortunately, very unlike me, I forgot to take a photo of all the food set up, so instead, you get to see the cutlery bundles I made up! I made Hawaiian Pulled Pork in the slow cooker, which turned out so tasty! I served it on soft rolls with some salad leaves, and I also made Tropical Island Rice which was well received as well. I served the pulled pork straight from my slow cooker to keep it nice and warm, and everything else went out on leaf shaped plates that I had bought. For dessert I made a deliciously moist and flavourful Pineapple & Coconut Upside Down Cake. I also set up a desserts station with ice-cream sundaes and store bought cupcakes that I prettied up with cocktail umbrellas. Always have to have bubbles at a party (IMO! ), so I bought some little tubes of bubbles from Poundland and we all acted like little kids for 10 minutes! As day turned to night, my living room, where we were all hanging out, turned into a home spa and nail bar. I set out a pampering set for each girl with a bucket for foot soaking, along with towels, nail file, head band and face mask. I had a basket of flip flops to show off our painted toes, and a basket of beach mats to protect the floor! Whilst soaking our feet, we put on an 80s classic movie – ‘Cocktail’, which we chose from my At Home Cinema kit – loaded with popcorn! With the evening slowly coming to an end, I handed out party favors to everyone and we all bid our goodbyes. Some of the girls stayed over, and the rest came back the next day for brunch! But that’s a whole other post! Honoured to be featured at Piggy Bank Parties! Love the fruity cocktail bar! Looks so fresh and yummy! Thanks for linking up on Oink!